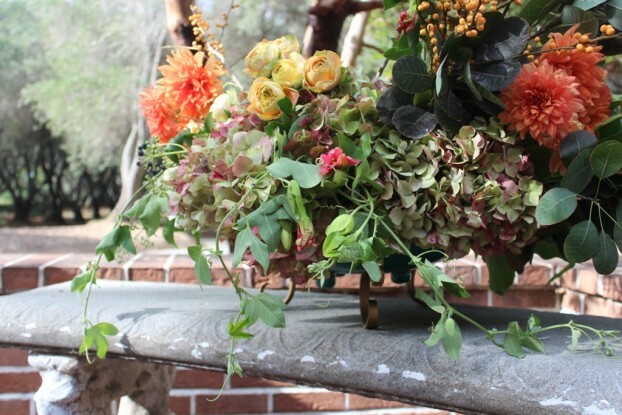 A detail of my arrangement demonstrated after my Slow Flowers lecture at Filoli. Note the lovely flowering passionvine tendrils dripping from the base. Filoli, the iconic early 20th Century estate in Woodside, California, is listed on the National Trust for Historic Preservation. It is a cultural institution where people come to learn, explore and be inspired by nature just minutes away from the city. 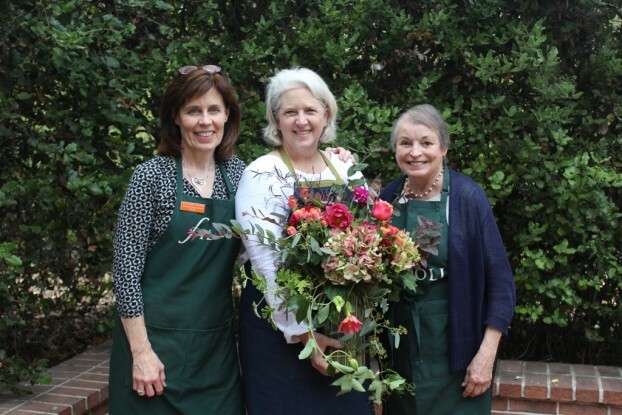 Filoli is also known for its Floral Design Certificate program and that’s what brought me there last Friday to lecture and teach, thanks to the invitation of Cathy Rampley, head of education, and Katherine Glazier, one of the instructors in the floral design program. When planning ahead to order flowers for a couple large-scale floral designs and a hands-on workshop for 20 students, I always tell the organizers that I want local, American grown flowers. Sometimes that’s easier said than done. Sometimes, like last week, it’s impossible to do otherwise. After all, we shopped at the San Francisco Flower Mart, which is where the best flowers available are California Grown. The scale of this vessel allowed me to go very wide with the branches and stems. I had so much fun digging through the storage closets at the Filoli estate house to select vessels for my designs. The ceramic piece you see above is measures approximately 14 inches in diameter, a turquoise-glazed dish mounted in a brass stand. Its shallowness challenged me and despite the 7-inch pin frog attached to the inside base, I mounded a large piece of chicken wire to dome over the opening. 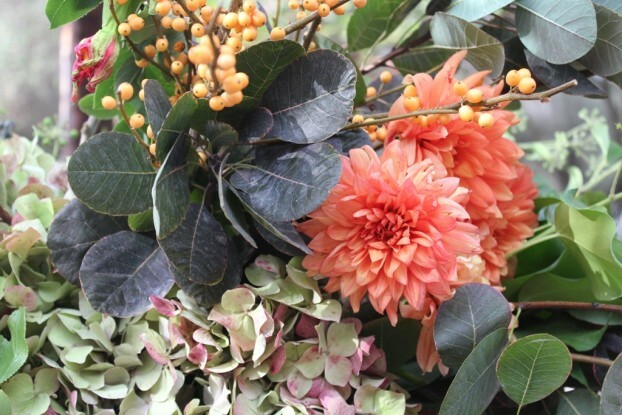 Detail of autumn colors and textures, including the Cotinus, the peachy-orange dahlias, antique hydrangeas and the yellow-orange Ilex. This arrangement proves my theory that when a vase is shallow, you can build the bouquet 2- to 3-times the width of the opening. Using smoke tree (Cotinus) clipped from Filoli by the gardening staff and inserted so it soars off to one side allowed me to exaggerate the horizontal. Several antique hydrangea blooms, sourced from Half Moon Bay nearby, rest on the rim of the bowl and anchor it visually. I needed quite a bit of greenery to fill the volume and hide the mounded chicken wire (seriously, this piece was larger than a basketball cut in half!). Lots of the foliage was sourced from Filoli, including a type of large-leaf ivy and coffee berry branches. I’m here with Katherine Glazier and Wendy Morck, the two instructors in Filoli’s Floral Design Certificate Program. I’m holding Katherine’s arrangement from our afternoon workshop. 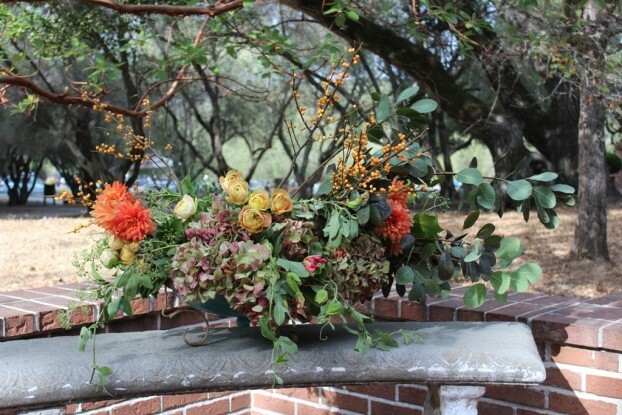 The focal flowers included ‘Helios Romantik’ garden roses and dahlias, both grown by Neve Brothers in Petaluma, California, as well as pale orange Ilex, sourced from Oregon Flowers in Aurora, Oregon. 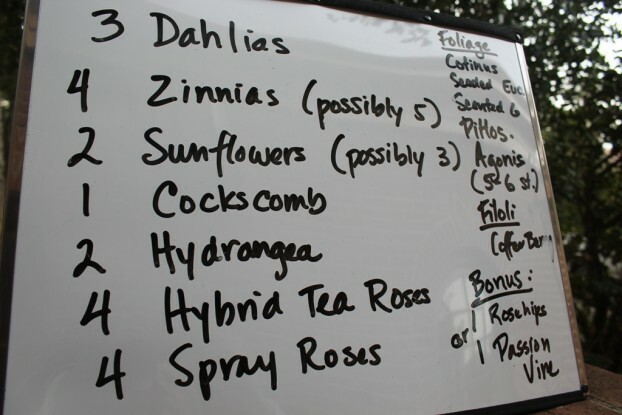 At the final moment, as Katherine and I were adding up my selections at the wholesaler in San Francisco, I asked about flowering passionvine. We were able to grab three bunches of the beautiful tender vine, with hot pink flowers just opening. A few stems of the vine add extra sparkle to the arrangement. The large urn from my lecture. 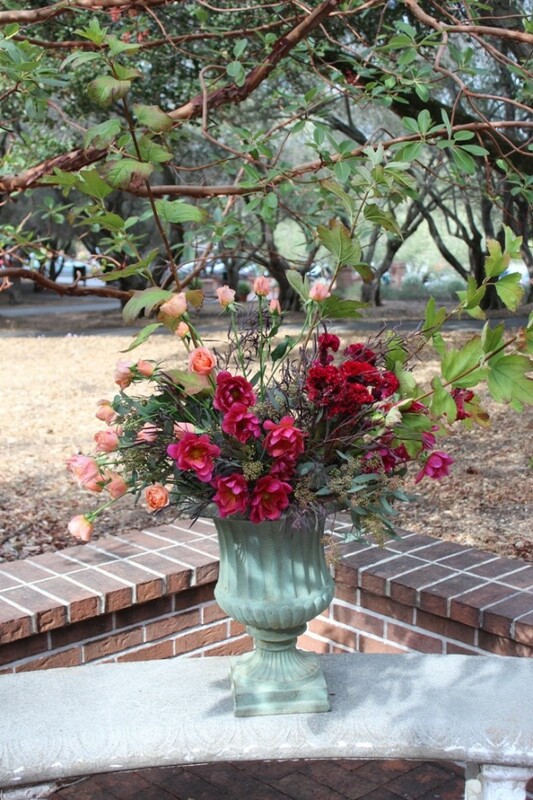 I also demonstrated a large vertical arrangement using a fiberglas faux urn, one of many used by the Filoli volunteer designers who decorate the estate. This allowed me to showcase some of the autumnal viburnum branches that the gardeners clipped for our use. Once I inserted five tall branches, I had a framework for adding other foliage — seeded eucalyptus and feather purple agonis, to fill the lower center of the arrangement. I’ve been experimenting with color-blocking of flowers as a way to give some imperfection to otherwise symmetrical arrangements. 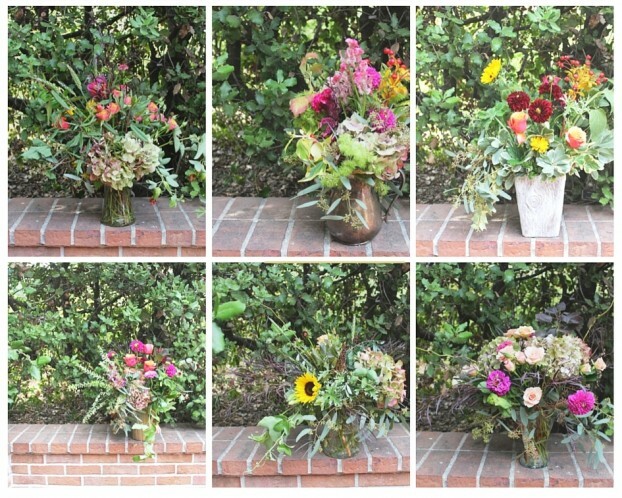 This design was a perfect excuse to block all of the deep pink and burgundy flowers to one side — dahalis and celosia/cockscomb. And then to allow a spray of apricot/peach roses to emphasize the opposite side of the bouquet. Getting organized was required with hundreds of stems to sort and distribute. Thanks Volunteers! You made our day go smoothly and creatively! The afternoon workshop allowed 20 students to experiment with all local flowers and mechanics like curly willow, chicken wire, foliage “frogs” and clear tape grids. Mostly we just designed to our heart’s content, working side-by-side with other creative individuals who took time to quietly admire the beauty of each stem before clipping and inserting in her vessel. I’m so thankful for the talented volunteers who prepped and organized each student’s selection of flowers and stems with which to design. 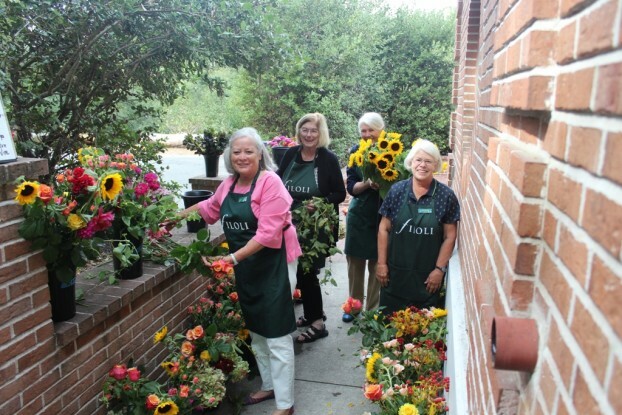 These people are the backbone of Filoli’s educational program. It was a lovely day. Nothing beats the experience of losing yourself in a floral design project, especially with kindred spirits and new friends, working together in an inspiring setting. Love the hot pink dahlias paired with these quiet peach roses. Against the dark foliage, they look even more stunning. 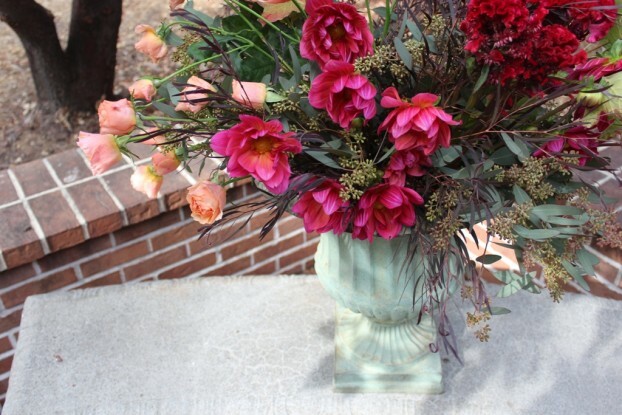 This entry was posted on Monday, October 26th, 2015 at 12:01 pm	and is filed under American Grown, Blog Posts, Creativity, floral design, General, Slow Flowers Challenge. You can follow any responses to this entry through the RSS 2.0 feed. You can leave a response, or trackback from your own site. It was a great day with you Debra. 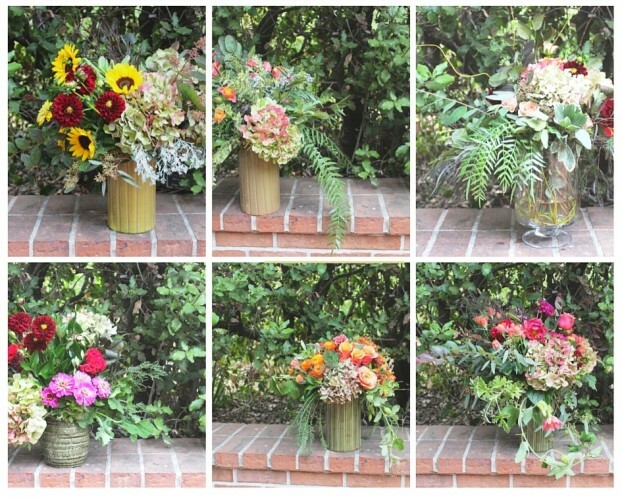 Everyone left pleased with their arrangements filled with wonderful California grown flowers and foliage. Thank you for visiting with us at Filoli and sharing your passion for American grown blooms! You are more than welcome to visit with us anytime. Kindred spirits need to stick together! !